Our visit began at a local pub packed full for a live music night with a front man in a kilt wearing a Tam o Shanter. Aberdeen is a city full of quirky and unusual bars and clubs to say the least (including Slains bar, look it up, it was… interesting and potentially a test of all of the senses). 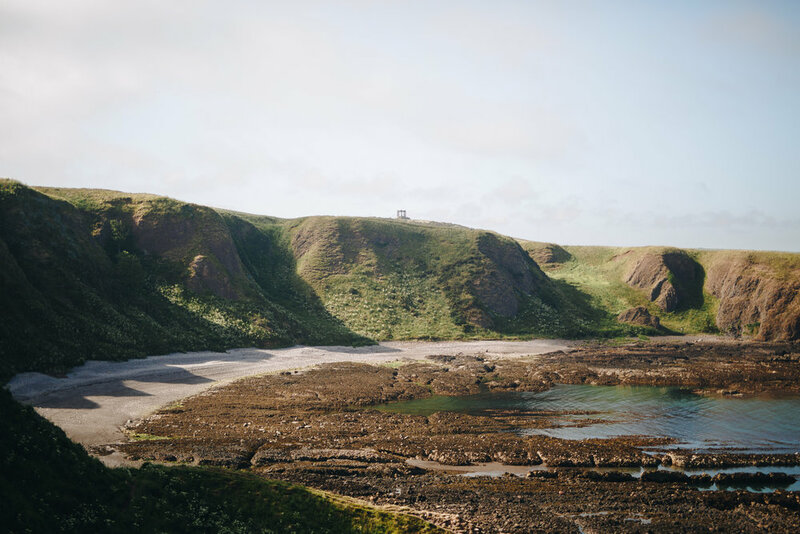 Moving away from the city with headaches the next morning we headed back out into nature and made a trip along the coast to Dunnottar Castle. This was the day I got biten by a crab and Sam mistook a medieval cesspit for a swimming pool. Dunnottar Castle is a site that has existed in some form since the 4th century, positioned like the workings of a fairytale on a cliff top looking out to sea. Dunnottar is written as ‘Dùn Fhoithear’ in Scottish-gaelic and means ‘fort on the shelving slope’. We visited on a perfectly clear summer’s day but I would very much like to go again some time when the tide is in, and the waves are crashing against the rocks as the mist rolls in off the sea. I imagine it would suit the ruggedness of this coastline and some of the harsh stories that have come from the castle’s history.